Cecilia Rebagliati has fast developed a name for herself as a designer to watch. In just ten short years, her Cecile Benac label of medium to high-end knitwear has captured the attention of consumers and fashion media alike. She has been designing for her own label since 1996. Before starting her own label, she managed production for a high-end knitwear manufacturer Cinema for five years. It was there that her boss, Carole Sinclair, encouraged her to create her own label. Her position gave her the ability to learn more about the production of clothing which ignited her to follow her dreams of creating a label better known as Cecile Bénac. She enrolled at Capilano College in their textile design program as well as Vancouver Community College's fashion design program. Originally from Lima, Peru, where she learned to knit as a child and later owned a ladies' boutique, the designer relocated in the late '80s to Vancouver, British Columbia. 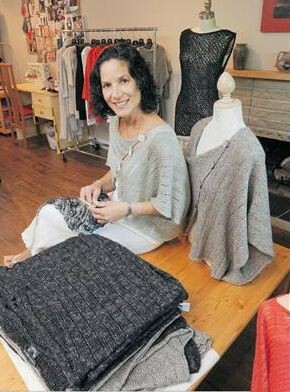 Here on Canada's West Coast, she managed production for a high-end knitwear manufacturer before striking out on her own. Through advanced studies in fashion design and textile art she has further honed her craft. In 2000 and 2001, the designer was honoured with Matinee Fashion Foundation grants, Canada's most widely recognized fashion award. Rebagliati is known for her use of innovative and luxurious yarns - featherweight loopy mohair, tie-dyed ribbon yarn and washable linen among them - imported from France, Italy and Spain.